Flavia Petrelli has returned to La Fenice, this time appearing as Tosca. Many years ago Brunetti met Flavia when a German conductor was murdered. Meeting Brunetti again after one of her performances she mentions to him that she has been receiving unwanted attention from an admirer. Yellow roses, and lots of them have been left for her in her private dressing room, and inside her locked apartment building. When another opera singer is attacked Brunetti realises he has to find the obsessive fan before Flavia is hurt. Donna Leon’s novels are very much character driven. I’d recommend reading the series from the beginning for part of the joy of the books is watching the characters develop over the years. Each one is vital to the story, impinging on how Brunetti investigates, be it with the help of Vianello or Signorina Elettra’s insights or indeed working in an alternative way to either spite or circumvent Bruentti’s annoying and snobbish boss Patta. Because the books are so heavily dependent on the characters I often find that the crime that drives the story takes something of a back seat. This could be said for this book. Brunetti rarely has to deal with gruesome crimes, though often they are sad and this sometimes makes them more effecting. In Falling in Love the crime is unusual in that this is a case of stalking, at once a rather personal crime but one that can be carried out by someone unknown to the victim as easily as by someone known. There are no clues dotted around to enable the reader to discover who the perpetrator is, we find out when Brunetti does. 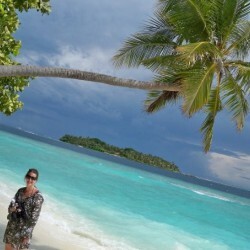 This is not to say that the story lacks something as a result. It does not. It was good to see how Brunetti identified who was stalking Flavia, helped as always by Vianello and the incomparable Signorina Elettra, who has connections that it is perhaps best that a police detective doesn’t enquire into. 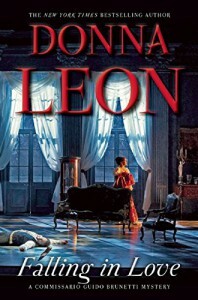 Donna Leon’s skill lies in the vivid descriptions she provides for scenes and location. The family life of Brunetti and the location of Venice are beautifully portrayed. In such novels as Falling in Love this is important for it rounds out Brunetti’s character and makes him the detective he is. As always, I looked forward to reading the latest Donna Leon and I was not disappointed with Falling in Love. Reading it was like returning to visit old friend and what an enjoyable return it was.